Our lasers are designed to target the body’s optimal light absorbing complexes to treat pain and accelerate the healing process. By combining several wavelengths and various modes of delivery all models are effective in treating pain, decreasing inflammation, and increasing circulation. Class IV K-Lasers deliver specific red and near-infrared wavelengths of laser light to induce a therapeutic effect within the body. These include increased circulation, decreased swelling, reduction of pain and enhanced tissue repair. Laser therapy has been used in Europe since the 1970’s and was cleared by the United States Food and Drug Administration in 2002. K-Laser has become the preferred choice for thousands of practitioners worldwide. During treatment, infrared laser light interacts with tissues at the cellular level. Increased metabolic activity within the cell stimulates the transport of nutrients across the cell membrane initiating increased production of cellular energy (ATP). This leads to cascade of beneficial events promoting the acceleration of the healing process and reduced pain. How often should a patient be treated? Acute conditions may be treated daily, particularly if they are accompanied by significant pain. More chronic problems respond better when treatments are received 2-3 times a week, tapering to once a week or once every other week, with improvement. How many treatments does it take? This depends on the nature of the condition being treated. For some acute conditions 4-6 treatments may be sufficient. Those of a more chronic nature may require 6-12 (or more) treatments. Conditions such as severe arthritis may require ongoing periodic care to control pain. How long before the results are felt? You may feel improvement in your condition (usually pain reduction) after the very first treatment. Sometimes you will not feel feel improvement for a number of treatments. This does not mean that the condition is not improving. Each treatment is cumulative and results are often felt after 3-4 sessions. How long does treatment take? The typical treatment is 4-8 minutes, depending on the size of the area being treated. Has effectiveness been demonstrated scientifically? Yes. There are thousands of published studies demonstrating the clinical effectiveness of Laser Therapy. Among these, there are more than one hundred rigorously controlled, scientific studies that document the effectiveness of laser for many clinical conditions. Can it be used in conjunction with other forms of treatment? Yes. Laser Therapy is often used with other forms of treatment, including physical therapy, chiropractic, massage, soft tissue mobilization, electrotherapy and even following surgery. Other healing modalities are complementary and can be used with laser to increase the effectiveness of the treatment. Does it hurt? What does it feel like? There is little to no sensation during treatment. Occasionally one feels a mild, soothing warmth or tingling. Areas of pain or inflammation may be sensitive briefly before pain reduction. Class IV K-Laser Therapy is proven to bio-stimulate tissue repair and growth. The K-Laser accelerates the healing process by decreasing inflammation, pain, and scar tissue formation. 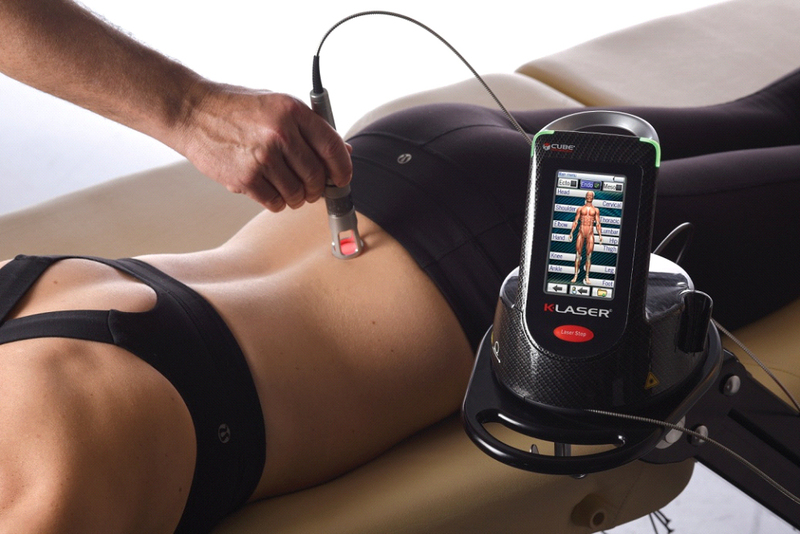 In the management of chronic and acute pain, Class IV K-Laser Therapy can provide dramatic results.